With just the right music, or a certain song can easily stir up one's emotions in ways you couldn't begin to describe. Just as a melody can effortlessly pull out an old memory that we've long forgotten about. Today's post is going to be all about how music could influence a person's mind, body, and soul. I'm definitely not a music expert what so ever. I don't really follow music trends, bands or anything in particular. However, I enjoy listening to whatever music I come across to like. Music that flows seamlessly with my current mood, a song that strikes just the right chord with the listener, and lyrics are written so vividly that conjure up thousands of images in my mind. There are ALWAYS a few songs that you find yourself coming back to over the years, the ones you could never get tired of listening to. Yeah, I have a list of those types of songs as well. I listen to a wide range of music, if you were to look at my playlist, you'd be surprised by the diversity, different genres and time period I listen to on a daily basis. I don't like to label myself as a certain music type of girl. You could expect to find a little bit of indie and folk-rock songs from the 60s and 70s, some 80s pop hits, some country tunes, and a lot of alternative songs on my phone. To me, there is no such thing as definite "good music' taste. People have a weird tendency to categorize certain music as cool or good, and so help me god if I were to listen to some generic bubblegum pop bands, my music taste is deemed horrible. Well, I think differently. I consider music as a way to express oneself, finding a song that you can relate to, a melody that stirs up a long-forgotten memory, or lyrics that touch your heart and soul. Regardless of the genre and artists, if you think the music is good, it is good, and no one else can say otherwise. Let's get talking in the comment section, who are your favorite artists? What are your all-time favorite songs? 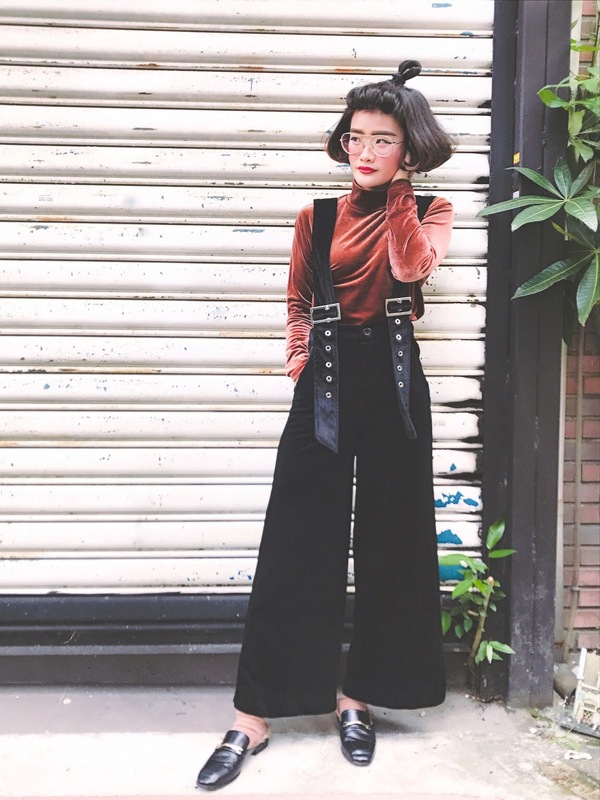 That velvet jumpsuit is the coolest thing I've ever seen! Lana Del Rey ♥ I love her! You look amazing! Love your velvet blouse!! Music is so personal. True. Some like classical, others like folk music. This is melody that touches heart. Your attire complements your artistic taste..
You look beautiful in your vintage outfit style.. I am loving your cozy sweater. Nice choice of ootd. I can say the same thing, I don't listen to a particular genre of music and I like songs from artists all over the world. Music is universal and whilst I do like a rock song on one side, I also love a pop one in the same time. My playlist is so varied as well. This vintage look is really cool, babe! First, this outfit is everything! I'm obsessed. I love all different kinds of music and I don't fit into one genre either. You can find bands/artists such as Tom Petty, Janis Joplin, Lana Del Ray, Beyonce and maybe a little bit of Kanye on my playlists. Such a cool fashion forward post: the pictures, light, photography and of course your outfit. Agree.The music I listen to fits the mood I am in. Sometimes I'll listen to Pink while I'm working out our something really mellow in the car. I even like music like Sade. I love your outfit. I agree certain songs can instantly change my mood and my thoughts. You have the prettiest hair style! Taylor Swift will always be my favorite artist. Ellie Goulding is a close second! Music is definitely a good way to express yourself and as a songwriter I find that it also is a great way to let some of this thoughts that hold me captive out and release them in a good way. I love to listen. No genre is a genre I do not really enjoy. I live for singing. My passion is writing. This is so amazing look, I like your style. The velvet is so in these days and the jumpsuit looks so pretty. Love the way you have paired it with turtleneck. I love this outfit on you!! And I love all the vintage vibes! Oh!! I am loving your vintage look outfit. You jumper is so cool and very stylish. Loving how you paired it with your turtleneck sweater. What a cool and bold look, it's so Pinterest worthy!! You are such an inspiration. 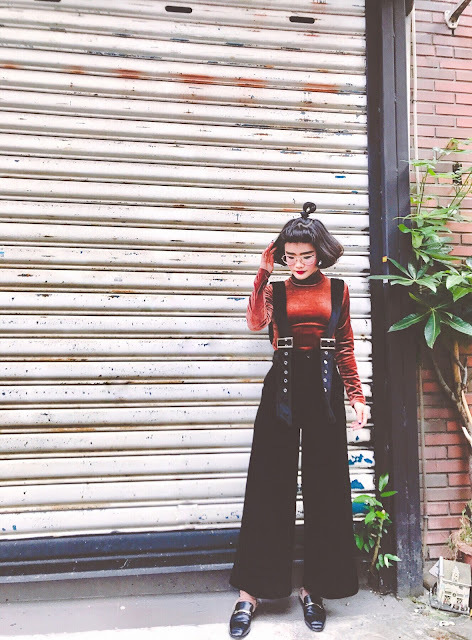 The velvet turtleneck with this jumpsuit is so perfect. This look is so cool. You've got a great sense of music. So true how hearing a song can take you back to a specific time or place. Absolutely love your look in the pictures. It's hard for me to pick favorite artists and songs b/c I love everything from jazz to country to christian to classical ... and throw in a bit of hip hop too :) Your outfit is super cute on you, btw!! Nice pictures here with lovely background. Music is very powerful too and empowers and connects with the soul..
Lovely outfit and a great post. I also like your background too. Music is powerful and connects to the soul. I have plenty of favorite artists! Taylor Swift, ED Sheeran, Akon, Lady Gaga, Adele are few of my favorites! Totally love that jumpsuit! It is so chic, stylish and you wear it so well. I am loving the velvet trend this season as well. Great playlist, and I'm loving your outfit! The jumpsuit is so beautifully unique!